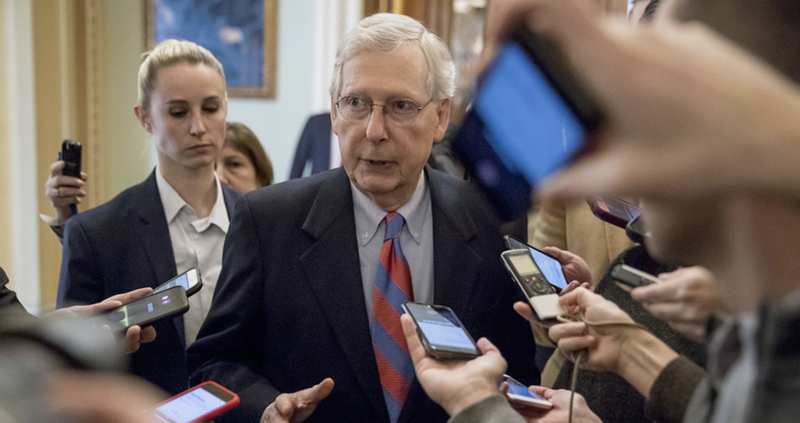 McConnell Says Senate Will Vote On Ocasio-Cortez's "Green New Deal"
Senate Majority Leader Mitch McConnell just lobbed what we imagine will be the first of many stink bombs into the 2020 Democratic primary. During a news conference on Tuesday where he was flanked by fellow Senate Republican, McConnell revealed that he plans to call a vote on the Green New Deal bill proposed by NYC Congresswoman Alexandria Ocasio-Cortez and Massachusetts Sen. Ed Markey, a plan that, as we have noted, is filled with extreme proposals like rebuilding every building in the US, and weaning the US off all carbon-based forms of energy within 10 years. Will they side with Nancy Pelosi - who derided the plan as AOC's "green dream" - and oppose the GND, or will they acquiesce to the demands of the increasingly far-left Democratic base. After President Trump dedicated part of his State of the Union speech to deriding the newfound socialist passions of Dems like AOC, the Republicans are clearly trying to tie Democrats to the "Democratic Socialist" agenda. Other Republicans who joined McConnell on Tuesday denounced the plan as "radical" and "way out of the mainstream" of American politics. "To me, this is just so extreme," said John Barrasso of Wyoming. "It is that radical. It is a bad deal for the American public." In a response to McConnell, Senate Minority leader Chuck Schumer managed to trash Republicans for their lack of alternatives on climate change, while not-quite-endorsing the GND. "What is their answer on climate change? What are they going to put forward?" Senate Minority Leader Chuck Schumer of New York told reporters after McConnell announced plans for a vote. So far, all five of the Senators who have officially launched their campaigns have also expressed at least a measure of support for the plan, which calls for a "national mobilization" to move the US economy off fossil fuels, to fight climate change, offer health care for all, increase wages and expand union rights, according to Politico.